You can now see my new pattern in my Etsy shop. 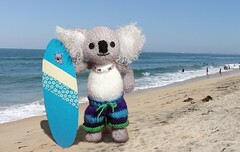 Cody is an awesomely cute little surfer from down-under. He's as easy to make as my other patterns, and even gives you the chance to use a bit of eyelash or mohair yarn (or both, like I did). His shorts are a great way to use up those little left-over bits of sock yarn. This pattern is dedicated to my good friend Faye, one of my first and best customers. Life has taken a bit of an unexpected turn, and I might not have as much time to work on new toys and patterns as I was hoping. But as the weather cools, I feel more productive and less tired in the evenings, so I may surprise myself. Posted by Barbara Prime at 8:30 a.m.